I never said I was running for State Senate in District 37. All I said was that I was moving into the district, and that a big announcement was coming soon. Both of those statements are cold hard objective facts, but a surprising number of people have jumped to the wrong conclusion. How could that have ever happened? The big announcement in Senate 37, however, comes not from me but from my friend Zach Wahls. I first heard of Zach the way most of us did - through his iconic and viral "two moms" speech to an Iowa legislative committee in 2011. One of my jobs as a now senior activist is to spot and help new young talent. Johnson County has had a poor track record of electing young people and I've long wanted to fix that. Too often we export our young talent - but Zach grew up local and has long been committed to building his life here. And as soon as I got to know Zach as a person and not just a video, I knew we had a special talent here. Zach isn't a show horse coasting on his moment of fame. He took that lightning-strikes opportunity and built from it. Wahls' first big project was Scouts for Equality. Like so many Eagle Scouts Zach was frustrated by the Boy Scouts' anti-LGBT policies, which had been in place since since 1978 and successfully defended all the way to the Supreme Court. That meant change had to come from within, and Zach and the Scouts For Equality team led a three year effort to successfully persuade the Boy Scouts to voluntarily change the policy. But Zach is not a one issue person and in his campaign he plans to focus on health care, education, and workers rights. He has a depth of knowledge and interest in a broad range of issues, and the homework a candidate and legislator needs to do. He's done the political hard work too, locally in the trenches and on the road helping other candidates And he's an all-around great guy who hasn't let political celebrity get to his head. I'll miss voting for Joe Bolkcom and Mary Mascher, and I regret not having one last chance to vote for Bob Dvorsky. (I lived in Coralville my first five years in Iowa, but moved before Dave Jacoby ran.) But my life transition has given me the opportunity to participate directly in this open race. 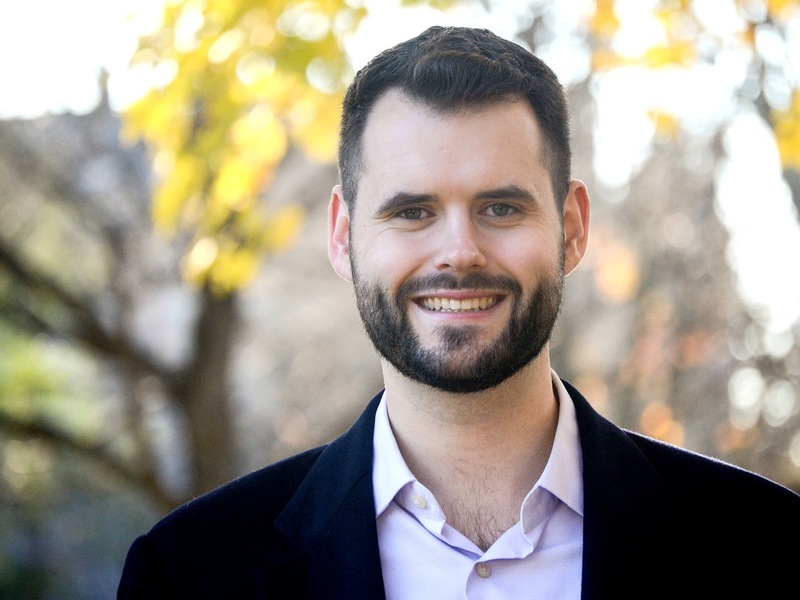 And I am proud to support Zach Wahls to be my next state senator. Lennon's Greatest Failure: Art, Politics, and "Some Time In New York City"
As a political guy, a music guy, and a political music guy, I've long been fascinated by John Lennon's most political record. Not fascinated enough to listen all the way through more than once - but fascinated by the circumstances and the rhetoric - rather, the rhetorical failure. 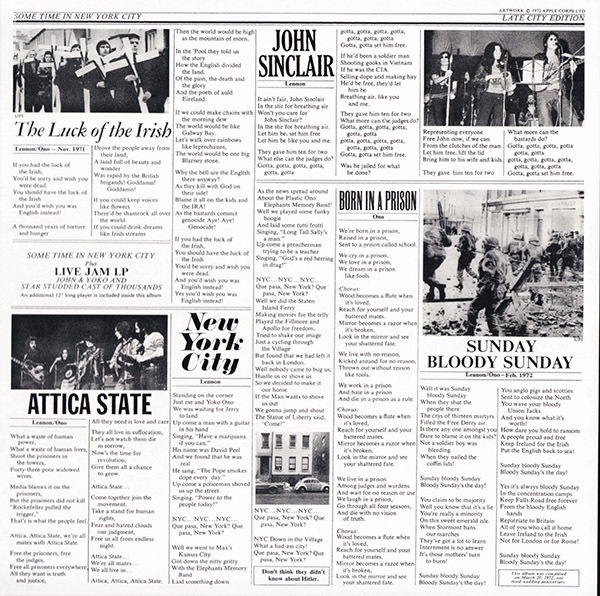 The 1972 album Some Time In New York City is a fascinating document of the difference between art and politics and of one of the most brilliant artists of all time failing to play to his own strengths. The album's reputation has dropped from its always low standing (being padded to a double with unlistenable live material and thus being pricey didn't help). The drop is in part because its strongest song, which was actually a low-charting SINGLE and included on Lennon's first hits collection Shaved Fish, is now lyrically taboo. I'm too gun-shy to even type the title; just look at the album cover. Neither John or even Yoko could get away with it today, any more than Mel Brooks could get away with "Blazing Saddles." Some Time In New York City is also damaged by its topical same-ness (an issue on some of George Harrison's more Hare Krishna-y albums as well). Lennon had flirted with lefty politics before, but it was always just ONE facet of a John or Beatles project. 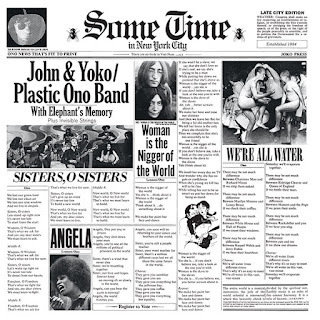 On John Lennon Plastic Ono Band, "Working Class Hero" sits alongside "Love" and "Mother." The title song of Imagine and "I Don't Want To Be A Soldier" share a side with "Jealous Guy." "Power To The People" I don't love, but it's just a single. New York City is a whole bunch of these songs, not quite as good as those I just listed. It would have been fascinating to have had an album of first rate Lennon material, or even split Lennon-Ono material, backed by Elephant's Memory. But this one-topic material includes no other part of the complex genius that John Lennon was. I don't want to listen to a whole album of ten "Power To The People"s all in a row. 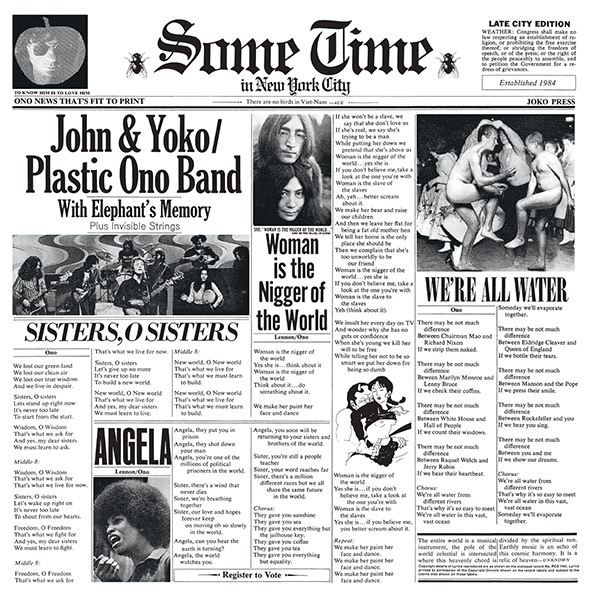 Gotta say it: instead of sharing album space primarily with Paul McCartney, John is sharing it with Yoko Ono. Not that Yoko can't be interesting or wasn't influential - just ask the B-52's - but she's not a Paul or a George. The problem with Yoko material is that when she attempted to write Western three minute pop/rock songs she was being compared to and heard alongside John, one of the two greatest masters of that particular art form ever. And she was being compared as a creative partner to McCartney, the OTHER greatest master of that art form. And even Yoko isn't at her best. She's writing in the same cliche sloganeering that John is. The fundamental problem with New York City, though, isn't the radical politics. 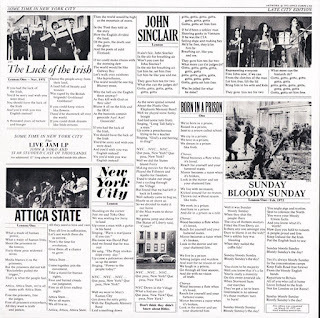 "Imagine" is on the very very short list for Greatest Song Ever, and "imagine no possessions" is far more radical that "free John Sinclair." It's that John Lennon tried to fit his politics into someone else's framework and dogma, and he let that dogma into the songs themselves. Dogma and art mix poorly. Five years later, the punks had similar left politics but made up their own rules. No one was more a political songwriter than Joe Strummer of the Clash, but he dealt with nuances (see the complex racial and class politics of "White Man In Hammersmith Palais" for a great example). But on New York City, for one of the few times in his life, John Lennon was playing by someone else's rules. The rigid left expected Lennon to follow the party line just like they expected Woody Guthrie to sell their newspapers on the street corner. Guthrie refused but Lennon, though only briefly, went along. The result was the weakest work by perhaps the greatest musician of last century. UPDATED: For not the first time, the Secretary of State has changed the game plan, as announced at a training of election staffers this week; in a surprise there has been an improvement. 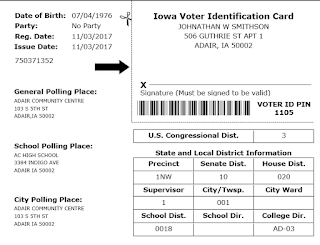 Iowa voter cards will have a new look this week as the details of the state's new voter ID law kick in, starting with a big mailing this week. Under the provisions of House File 516, an Iowa driver's license is the default voter ID. (This also includes Iowa DOT non-driver ID cards. For the sake of brevity, from here on out every time I say "license" I also mean "or non-driver ID.") There are some other limited options, but these options do NOT included licenses from other states or student IDs. Voters who do not have an Iowa license are supposed to be sent a special ID card to use instead. This provision of the law was added, likely with some reluctance, to help HF516 withstand legal challenge. Rulings on laws in other states have held that, if a voter ID is required, a free alternative must be allowed. Over the weekend of November 18, the Secretary of State processed a cross-reference between the Iowa license database and the driver's license database. They also changed some reports in the voter system so that new voter cards will conform to the details of the new law. Many voters who actually have Iowa licenses did not have them on their voter records. Some simply left them off the registration form, because more people remember their Social Security numbers than their licenses. One or the other is required (I'm skipping some detail here). But most of the newly included license numbers were for people who registered before 2003, when the federal Help America Vote Act (HAVA) kicked in and we started asking for license numbers. There will be two different kinds of voter cards. The terminology is a little confusing, and which one you get depends on whether or not you have an Iowa license. They are fold-over cards and look identical from the outside. 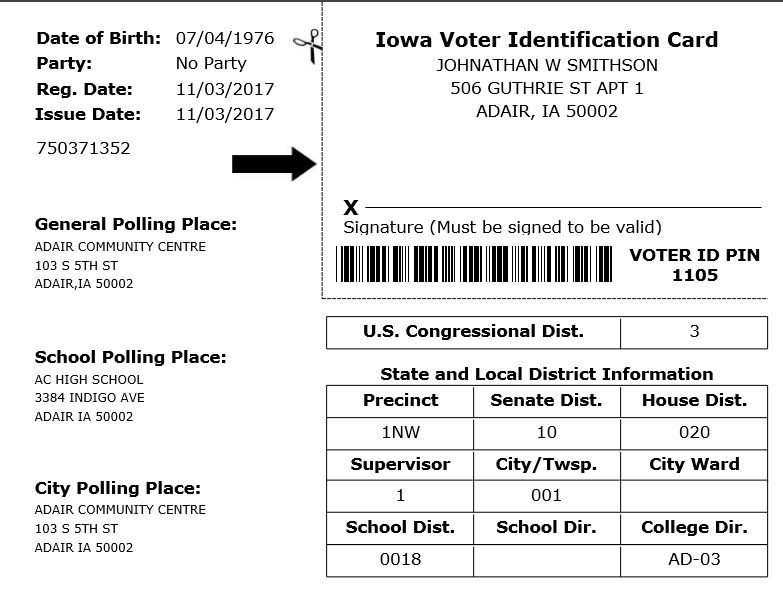 This is the "Voter ID" card that people without Iowa licenses will get. 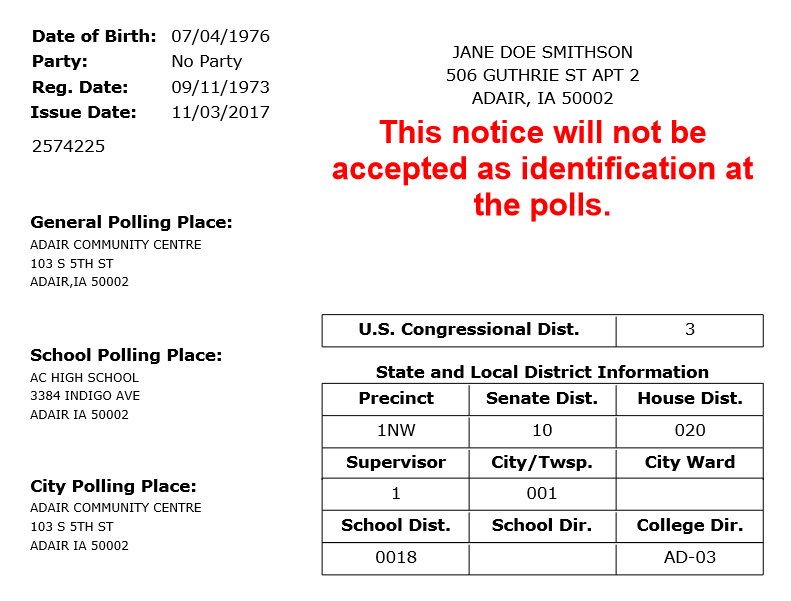 The initial mailing to the 123,000 people currently registered without an Iowa license is scheduled for December 6 - a very off-time for the election cycle, so many of these very very important cards will be ignored, misplaced, or discarded before they're needed next year. In a change from the original plan, this first wave of cards will be mailed in an envelope with a page of explanation. After that, they will get sent as cards. It's worth noting that these cards look very, very different than the Iowa licenses that most people will be showing. That singles out these voters and makes them more obvious to people who want to challenge voters at the polls. See also the PIN listed just below the signature space. 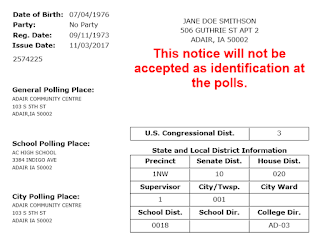 If you don't have an Iowa license and want a mailed absentee ballot next year, you will have to include this obscure piece of data on your request form. And, in a nasty bureaucratic twist: Even though your friendly local election staffer can look at your voter record and see this number, they cannot use it to complete your form. They will have to contact you by phone or by snail mail, during an early voting window that has shortened from 40 days to 29, to get you to give them a number that your friendly local election staffer can not only see, but that they can find more easily than you can. Voters who do have an Iowa license will not be part of this week's mailing. They will still get a card in the mail whenever they update or change registration. But this will be called a "confirmation card" or a "verification card" to distinguish it from the "ID card." One not as big but still significant change with these cards: The correction and change space that was on the old voter cards is now gone. That was an easy and fast way for voters to make changes by mail. Just write in the stuff that changed and sign it. Now they'll have to complete a full voter registration form. There's also a bar code missing from the confirmation card that used to speed up my work a lot. Both of the new cards were programmed into the state voter registration system over the weekend of November 18, so there are a few already in circulation. After the initial mailing by the Secretary of State next week, both these cards will be mailed out by auditors regularly, each time a voter registers or makes a change. Which one you get depends on whether or not you have an Iowa license. Any time there is a large voter card mailing, many cards are undeliverable. When mailings are returned as undeliverable by the post office, auditors are normally required to place voters on "Inactive" status, a preliminary step to cancellation. Voters who are inactive through two general elections get cancelled. Because of the voter ID law, there's an extra mailing going out to a particular, non-random group of voters, and because they're being sent an extra mailing, they're more likely to have a card returned to sender. In a big change of plan that seems to have been written by lawyers, this one-time mailing will be an exception. The letters (envelopes with a card in them, that is) will go back to the Secretary of State, not the auditor, and voters will NOT be inactivated from this mailing. That's because inactivating people from this mailing could be seen as illegal "targeting" of certain voters. Since they're not getting inactived, this isn't AS horrible as what I had feared at first - but sill, these are the people who need to get these cards to vote. And the population getting these cards (or not getting these cards) is the most mobile and least rooted group of voter, exactly the kind of people that the legislators who passed this law would rather see not voting. Many conservatives (and even some "liberals") have never gotten over Symm vs. United States, the 1978 Supreme Court ruling that held that yes, college students DO get to vote in their college town. Most people have begrudgingly accepted that students should get to vote for president (the only ballot most students actually cast) but resent young people weighing in on local things like tax questions or how old you have to be to get into the bar. The unspoken implication of HF516's refusal to accept valid out of state licenses and student IDs at the polls is: Kid, you're supposed to be voting an Illinois absentee ballot. But 20 years on the job tells me that the most likely way a student gets to cast a counted vote is to do it at school. After the Secretary of State's match-up between the voter file and the license database, there were 7030 Johnson County active status voters without Iowa license numbers, who should be getting cards in this week's mailing. That's 7.7% of the county's total active registration. Because the last "big" election was the presidential, most voters have not updated their address since the fall of 2016. In my town, most young people move every year on August 1, so the voter ID cards will be getting mailed to LAST year's address - which means more cards returned to sender and not getting delivered. So let's guess at just how accurate these addresses are. 425 people without Iowa ID numbers have voted since the presidential election. Another 165 have registered since the presidential election and not voted yet. Odds are these are good addresses. 4324 last voted in the presidential election, and these voters are likely still registered at their fall 2016 addresses. 1306 last voted before the presidential election, and 810 registered before the presidential election and have never voted. Many of these people have moved away, and actually should be inactivated and ultimately canceled. Any of these people needing to re-register will need to do a paper registration form - because Iowa's online voter registration system is only good for people who have Iowa license numbers. Here's some more stats on the 7030 voters without license numbers. 5977 of them are going to addresses in the city limits of Iowa City. Iowa City is 51% of Johnson County's registration, but is getting 85% of this mailing. 3437 cards are going to the core student precincts - Iowa City 3, 5, 11, 19, and 20. That's 49% of the mailing going to just 11.5% of the registration. 1334 cards are going to dorms, almost all to fall semester 2016 addresses. 55% of the people getting mailed ID cards live in apartments or dorms vs. 23% of all active status Johnson County voters. 1621 cards are going to voters under age 21; almost all of that is students because townie kids living with parents are likely to have Iowa licenses. And if you want to get partisan: The mailing of 7030 cards is 5% more No Party than overall registration, 4% less Republican, and 1% less Democratic. Mail can be iffy, especially at the holiday season. Anyone who believes they should have gotten an ID card (remember, only the people without Iowa licenses will get these) and hasn't gotten one by Christmas should check in with their auditor.